British Formula One sensation Lewis Hamilton says he wants to remain at McLaren for the rest of his career. The 22-year-old says he is not driven by money and would not be tempted by a lucrative switch to rivals Ferrari. He said: "I love everyone at the team, I enjoy working with them and I couldn't imagine working anywhere else. "If I'm not happy then team boss Ron Dennis and I have to sit down and talk. But that's not the case. I have a great feeling about this team." 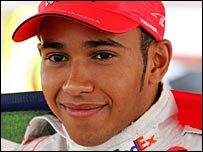 Hamilton, who heads the championship by 14 points in his rookie season, said he would have driven a McLaren for free this season because he feels such a strong emotional tie with the British-based team. "There is a lot of emotion there because I have grown up with them," he said. "Everything is perfect at the factory with the way things are run and the people there." Asked about a potential lucrative Ferrari offer, Hamilton replied: "I would not find it difficult to say 'no' because I'm not here for the money. It's not something that has driven me to get to Formula One. "If Ron Dennis had come up to me last year and said 'I'll give you the drive, but you are not going to get paid' then any driver would have jumped at it. I believe that. "Sure every driver has his value and you want to be respected - and at some point you have to be paid your value - but again money is not something that drives me. "As I've said, I'm really, really happy here." Hamilton, who has been with McLaren for nine years, has finished on the podium in all eight races this season and has two victories to his name, winning in Canada and the United States. He will hoping to make it three this weekend when he competes in the British Grand Prix at Silverstone. Hamilton finished third in last week's French Grand Prix but still extended his advantage at the top over McLaren team-mate and double world champion Fernando Alonso. Kimi Raikkonen won at Magny-Cours, with Ferrari team-mate Felipe Massa taking second.